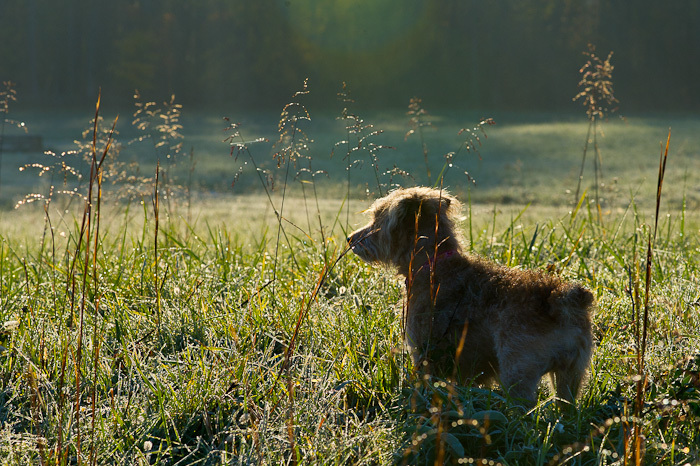 What could be better for a dog than a crisp fall morning and a squirrel to chase? Well, Peppermint has enjoyed the fact that we’ve now returned to filling the bird feeders in preparation for the winter. With the added bird seed comes squirrels, and lots of them. Each morning Peppermint bounds down the stairs to the front door, eagerly anticipating a quick leap off of the front porch and a startled squirrel to chase. Then, if we take an afternoon walk, she’s on the alert for the squirrels that we’ll stumble across that are preoccupied with collecting acorns and other nuts and might not see her until it’s too late. Thankfully, it’s never been “too late” for the squirrel. So far, Peppermint hasn’t even come close to catching one, and I’m not sure what she’d do if she did get close enough to grab a mouthful of fur. Although she’s a Jack Russell, she doesn’t really have the characteristics of a tough terrier. She loves small children, plays tug-o-war without much aggression and leaves a wide berth around the cats she meets. But, like most dogs, Peppermint knows a squirrel is fair game even though it’s likely a game she’ll never, ever win.